We have started a tradition, Chez Chambers, that Tuesday night is 'games night'. We put the girls down, clear the table (and wipe off any remnants of sticky chilli sauce), put some music on and crack out a game. It is a lovely change from watching TV together, which is wonderful too, don't get me wrong. We invited Mum to join us, as she is partial to board games. Then, it evolved into Dad coming down to watch, hang out and listen to music as well. It has been going on for a few months and it is one of the highlights of the week. A big bag of pistachios, a bottle of Prosecco and maybe some pastis for Craig makes it all the more enjoyable. Our game of choice has always been Carcassone. 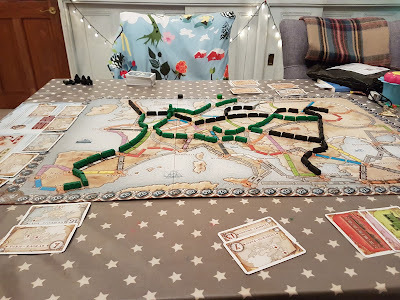 A really great game that is so easy to play, even the kids can join in. It basically consists of placing 'tiles' to build cities and roads. 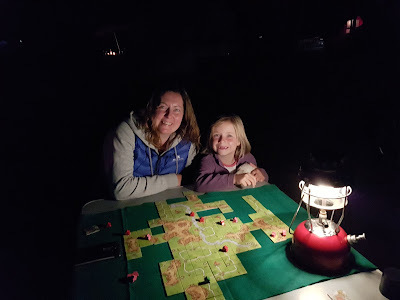 We even took Carcasonne camping with us. Here we are under the stars on our french adventure in the summer of 2016. Last night we braved a new game called Ticket to Ride. The basic premise is collecting sets of cards to allow you to lay down track between cities. Craig has played it before with D and D friends but it was my first attempt. Craig finished with a score that was more than double mine but I didn't do too bad (I think). It was nice for a change.